The staff, native Keralans dressed in the traditional local garb of saris and dhotis greet you with smiles and sparkling eyes. Taking your luggage, they embrace you not with arms but with genuine warmth of spirit as they lead you to your assigned cabin. My cabin is all wood inside and out, the doors emblazoned with intricate gold etchings and a golden peacock, but I hardly notice the doors because the view from the spacious wooden porch takes my breath away. It’s on the 2nd floor, and hibiscus and banana trees stand so close I can reach out and touch their leaves from the edge of the balcony. Through the leafy trees I see the valley below spread out before me, dotted with tiny rooftops of what must be a small village, and beyond the valley, hazy ridges of mountaintops that rise in tiers like distant waves in the ocean, and above them, a dusky blue sky. The air is filled with a gentle humming chorus of birds chirping. My mind, which has been racing around chaotically the past couple weeks, suddenly settles into serenity. An inner knowing of: yes, this is what I was looking for, floats through me from somewhere deep in my soul. 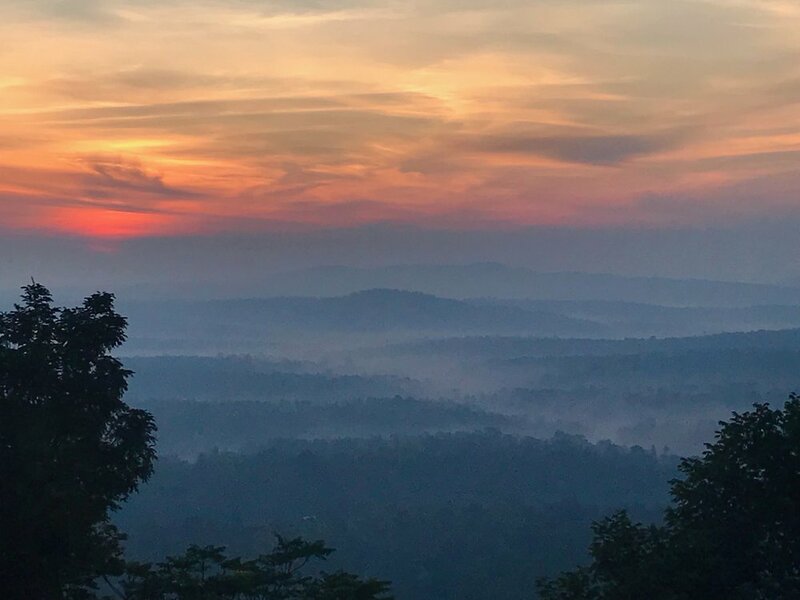 Udayagiri sits in the quiet center of the state of Kerala, South India, surrounded by jungle and mountains on all sides, a winding, scenic 4 hour drive from the nearest major town (Calicut). I’ve come for a three week panchakarma, an extremely thorough ayurvedic detox program. It’s supposed to be like pressing a reset button, eliminating all deep seated physical toxins and putting you back in tune with the rhythms of nature. 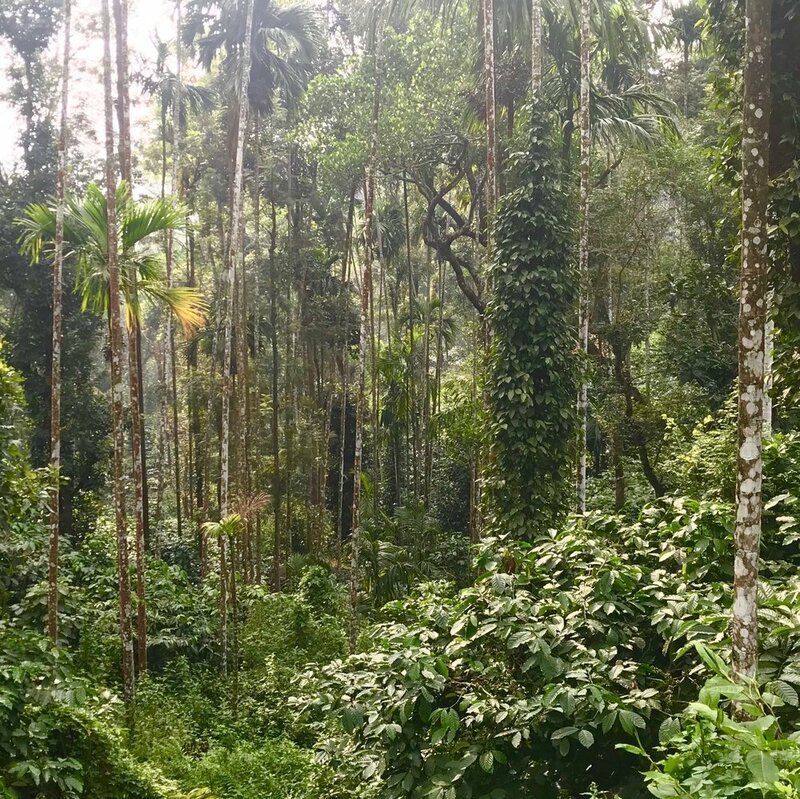 I’ve spent three weeks exploring Kerala, the birthplace of Ayurveda, and have heard rave reviews about panchakarma from many people, so I’ve decided to give it a try. I don’t have any serious health issues, but I’m sure I have my fair share of accumulated toxins and I could use a reset. 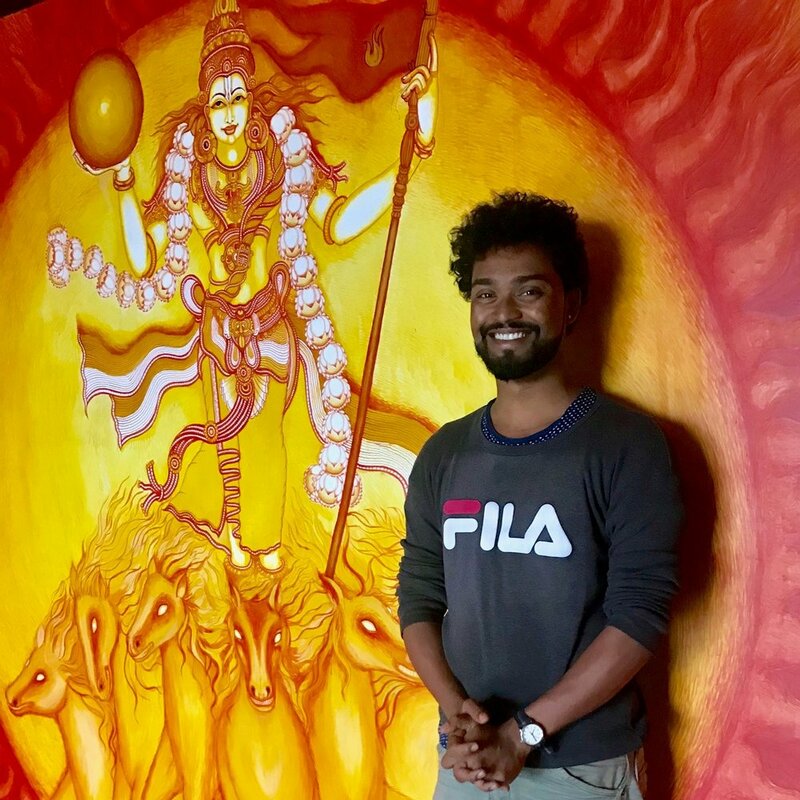 Udayagiri’s program involves daily massages and daily consultations with the doctor, as well as delicious, organic, nourishing food, and that all sounds good to me. The morning after arrival finds me lying naked on my back on a wooden massage table while three Indian women dressed in colorful saris stand over me, rhythmically drizzling steaming hot medicated water over my body from golden pitchers that resemble Aladdin’s magic lamp. This hypnotically relaxing procedure goes on for 20 minutes. It was preceded by a one hour four hand full body abhyanga oil massage. Every day these are braided into necklaces. The treatment room I’m in, with its heavy curtains, ornate table, gold pitchers and dark haired women in their saris, lends an ancient, fairy tale feel to the setting. I feel like I'm Esther from the Bible being prepared for the royal wedding to the Persian king. So far, I’m totally okay with this panchakarma deal. It feels like total bliss. As reality would have it … not every moment of the following three weeks could be described as absolute bliss. Panchakarma is extremely thorough in its methods of removing from your body any and all toxins you have accumulated over the course of your entire life. It leaves no stone unturned, and as you might imagine, the process can occasionally be somewhat brutal. More about that later. First, let’s talk about the pleasant highlights of this experience. Aside from the allegedly unavoidable discomfort of some of the treatments, the days here flow by filled with pleasure and relaxation, and I can honestly say I’ve never felt so thoroughly taken care of in my life. I’ve also never felt so much contentment to simply sit still for extended periods of time admiring the nature around me. There seems to be something magic in the air here that dissolves restlessness. We all feel it (most of the time). “We” is the small group of us here. We’re an international mix: British, Dutch, Brazilian, Israeli, Swiss, French, Swedish, Indian and me, the lone American. The group is constantly evolving, with some people departing and others arriving, but there are usually around 10 of us. The average length of stay is 3 or 4 weeks. The small group size is nice; it gives the experience a cozy, family-like setting. We bond over shared treatment experiences and love of the food, nature and massages. We also have individually scheduled doctor consultations, massages and treatments every morning or afternoon. For me, the schedule leaves the perfect amount of free time for relaxing, reading and occasionally walking. One pooja a day is enough for me (a pooja, or puja, is a traditional Hindu devotional ceremony), so I usually skip the 5am one, but the morning yoga classes are very nice. Our instructor, Renjeev, is a quiet, sincere, extremely flexible South Indian man. His classes are meditative but physically challenging – he gives our muscles a good workout, which I appreciate. On days he is out of town, he's replaced by the jovial, good-natured Aru. 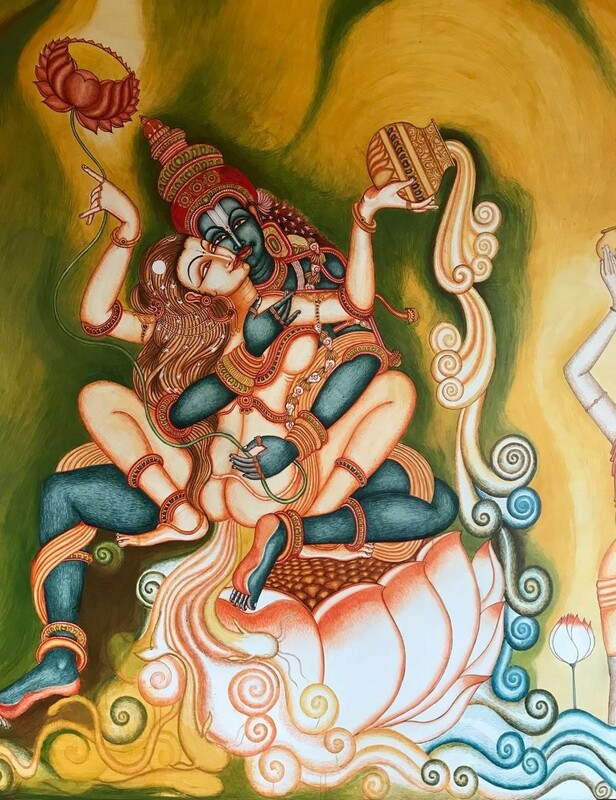 The yoga room itself is a striking masterpiece: its four walls are painted floor to ceiling with vibrant, intricate depictions of Hindu deities and scenes from epic moments in Hindu mythology. I admired them daily, ignorant of their identities, until one day the artist stopped by and explained the story behind each image. It was like a mini Hindu Mythology 101: Annapoorna (or Annapurna), the goddess of food and nourishment; Shiva, the destroyer/renewer; Surya, the sun god, wearing a garland of lotuses (because he loves lotuses); saints performing tharpanam (making a water offering) to Surya asking for blessings for the day; Vishnu and Lakshmi entwined together representing the creative sexual energy of the sacral chakra, balancing a jug from which water flows, because all life comes from water. Then Lakshmi alone, as the goddess of beauty – holding a mirror, because she takes the form that represents each person’s idea of beauty; an ascetic yogi meditating (oblivious to beautiful Lakshmi just a few feet away); the earth goddess, who takes the face of a pig when she’s angry, otherwise she’s a beautiful woman; Ganesha, the remover of obstacles; the moon god, seated on a lily; Shakti, painted in different stages of her life, like the seasons of the earth, and Prince Rama, his wife Sita and loyal Hanuman. 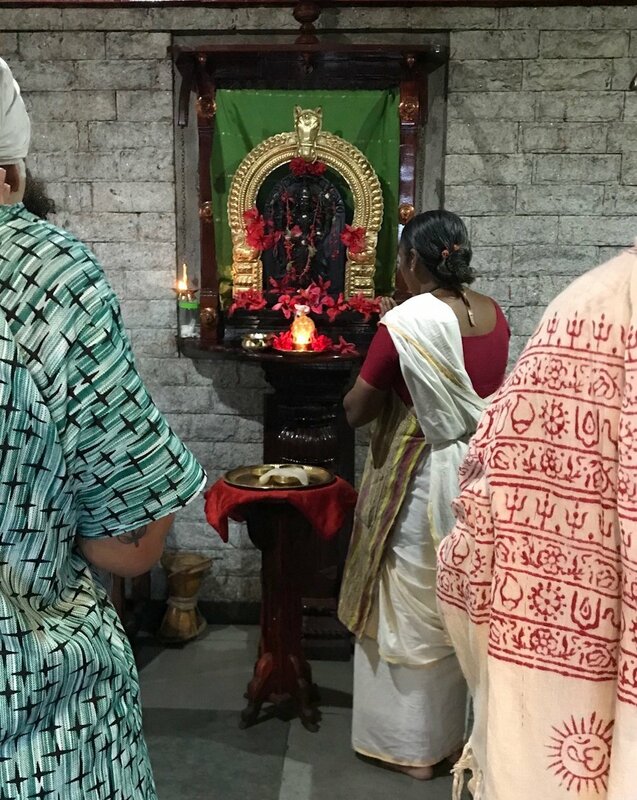 An interesting fact I learned only recently is that although the Hindu religion includes an extensive number of deities, some branches of Hinduism are monotheistic. They believe that, as expressed in the Upanishads (ancient Hindu scriptures) the individual deities are simply different aspects of the one God’s personality, expressed individually for the sake of easier human understanding. Just above the yoga hall is the kitchen and dining room, and there again we find Annapurna, goddess of food. Every day at the sound of the bell signifying breakfast, lunch or dinner is ready, we gather with the staff in the kitchen near the statue of the flower-garlanded goddess for the chanting of thanks and blessings for the food, which always finishes with a resounding blowing of the conch shell horn. Then, seated on the porch with a spectacular view of the mountains, we are served our nourishing breakfast. 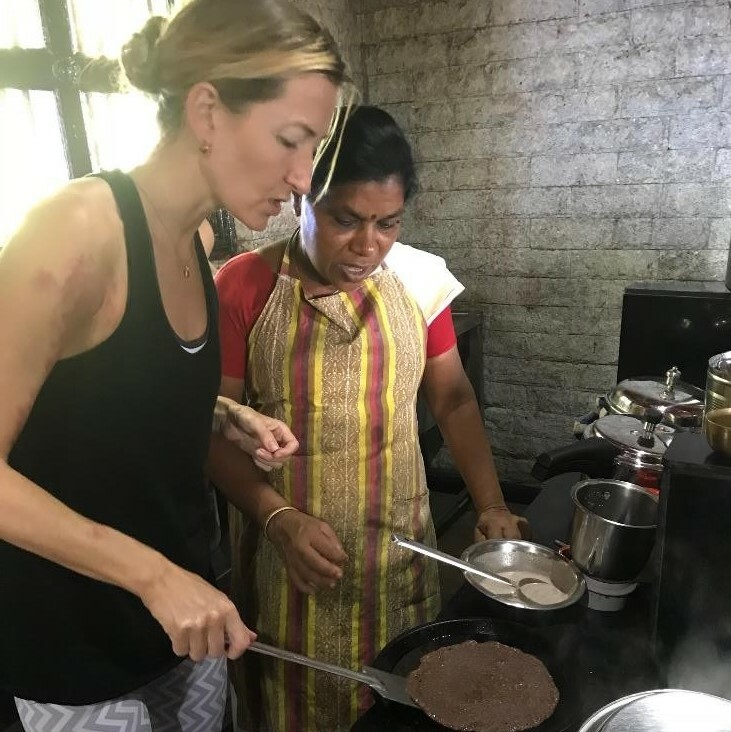 All of the meals here are unfailingly delicious and filling – often dosas and curries and rice and samosas, sometimes banana-leaf wrapped packages, sometimes a chili-like dish with kidney beans, sometimes savory sautéed veggies like long beans, and sometimes a little dessert. (The only sweetener they use is jaggery, an unrefined sugar made from sugarcane.) They give us seconds, or thirds, of anything we want. The meals are adjusted to accommodate the dietary needs of each client – some are gluten-free, some are dairy-free, some are weight loss – and depending on which day of treatment you're on, you might be restricted to rice porridge or kichari (simple, but still tasty). We never have fruit other than baby bananas, or coffee, but in the mornings before yoga a delicious coffee-like hot beverage is available for us in a large thermos in the dining room. On Sundays at lunchtime, a true feast of approximately 12 different dishes is served to us on banana leaves – unless our treatment schedule happens to have us on a day of kichari or rice porridge only. In that case we can either eat alone away from the sight of these culinary delights or watch everyone else savoring their feast while we dutifully eat your porridge - but our Sunday of feasting eventually comes. The food is so good I want the recipe for just about everything. Kishor, the charming manager who keeps everything flowing smoothly here, graciously tells me I’m welcome in the kitchen anytime I want. 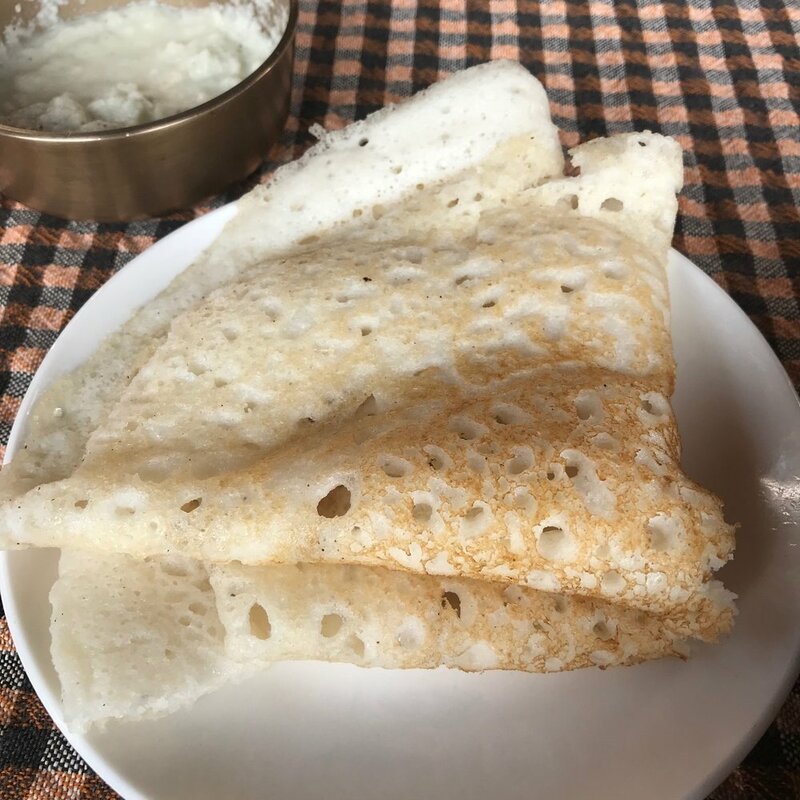 I take advantage of this offer a few times and sweet, motherly Barathi teaches me how to make kichari, and delicious feather-light millet dosas, and shows me how they grate the fresh coconut. The road outside Udayagiri’s gates makes for a peaceful, scenic walk through the jungle. Fifteen minutes and a few turns will take you into a small village, where the slightly surreal, otherwordly feeling continues. I’m impressed by the size and modern style of the houses, and by the friendliness of the people. Everyone smiles and waves, and the kids are heartstealers. They love having their photos taken. “One photo please!” they yell to me while waving hello. Of course I'm happy to comply and capture their cuteness on camera. Evening pooja after dinner is another trip back in time. It’s usually led by our yoga teacher Renjeev, dressed in a white sleeveless robe. His quiet, sincere devoutness is unmistakable. The pooja takes place in the appropriately named Pooja Room, illuminated by rows of tea candles on and around a low altar topped with a pile of wood. We seat ourselves on the floor near the altar. Renjeev (or Aru) performs each step of the ritual, silent except when chanting in Sanskrit. We're given printed handouts of the Sanskrit so we can join the chanting if we wish. On my second day, one of the doctors beautifully explains to me the symbolism of each step of the pooja. In Ayurveda, and in the ancient holy scriptures of India, the five elements are directly related to our five sense organs: fire to our eyes, water to our tongue, space (or ether) to ears, earth to our nose and air to our skin, and those elements have the capacity to purify or give energy to our body. The ringing of the bell during the pooja stimulates our ears and purifies our body through our sense of hearing. Drinking the water that is poured into our hands from a small gold pitcher purifies our tongue and digestive system. The medicinal ghee poured into the fire contains 16 different medicines, and the combination of those medicines and the ghee produces the purifying compound phenolinic acid. The phenolinic acid in the smoke from the fire purifies the atmosphere (air) and when we wave the smoke toward our faces, it purifies our body, our nose and sense of smell in particular. Chanting the Sanskrit mantras creates a healing vibration in our body, tranquilizes our mind and helps our system get back into rhythm with nature. Near the end of the ceremony, we take a teaspoon-sized amount of a surprisingly delicious medicinal powder. The doctor tells me it contains 4 different medicines, but it’s called pancha veja (sp? ), pancha meaning 5. The fifth medicine is our mind, and we’re meant to focus on the healing effect of the medicine as we take it - as we are meant to do with all ayurvedic treatments and medicines. In the end, our whole body and mind are symbolically purified – that’s the effect of pooja. So pooja is not only a sacred ceremony honoring the divine, but also a purifying, healing ritual for our mind, body and spirit. After pooja we retire to our rooms for the evening, and all is quiet except for the sounds of the jungle – and the occasional monkey running across the bungalow roof. I’m usually asleep by 9pm, and I have vivid, eventful dreams every night. Most of us do – something about this place, or the treatment process, makes you dream. As for the treatments themselves … well. Let’s just say they were my least favorite part of the program, with the exception of the massages and shirodhara (warm oil poured over your forehead for 45 minutes; an extremely relaxing treatment which sometimes leads to a state of profound bliss), which I would happily repeat anytime. I won’t describe the other treatments in detail here; I will just let you know that I survived them. If you want to know more, I recommend a short book called Ayurveda & Panchakarma; the Science of Healing & Rejuvenation, by Dr. Sunil Joshi, which beautifully explains Ayurveda and the methods and reasoning behind panchakarma. The doctors here won’t force you to do anything you’re not comfortable with, but be forewarned that they can be quite persuasive. On my first day of consultation with one of the doctors, after she described the Vamana process (drinking large quantities of milk and licorice tea followed by controlled, therapeutic vomiting) I firmly announced I would be skipping that one. What could I say to that? Did I come all this way here for a treatment that’s less than perfect? I gave in. “It’s really not that bad,” she tells me. For a few others, it wasn't that bad - but for me it was. That was the occasion of intense mental suffering referred to earlier. And yet, after the doctor told me there are no shortcuts, as I sat there trying to gather the willpower to force down another glass of licorice tea instead of running out of the room, I had a moment that was either a premonition of the future or my vivid imagination rising to the occasion to get me through this – a flash that was part thought, part hazy vision, that told me, there’s a beautiful future waiting for you – but this is part of your path and you have to go through it to get there. Whichever it was, looking back now I can see that episode as symbolic of the recurring lesson life reminds me of from time to time: that sometimes you have to go through pain or discomfort to get what you want. If you're not willing to suffer temporarily, you won't get the long term joy. I've learned that lesson more than once before, but every situation is its own new challenge, and making the choice to go through the pain instead of turning away doesn't necessarily get easier with time. My automatic reflex is to turn away and avoid discomfort when it confronts me, and I suppose that's why I get these reminders/practice opportunities. In this particular case, I didn't run away. I kept drinking, and soon enough that experience was mercifully over. Fortunately for me, that was the worst of it. The remaining treatments were a relative cakewalk. Not everyone at Udayagiri came for panchakarma. Some were there with serious health conditions and weren’t physically strong enough for a full panchakarma. Others came intentionally for milder programs: for rejuvenation, weight loss or a wellness vacation. Regardless, every person had an individualized treatment plan designed specifically for them by their doctor, and a 30 minute consultation with the doctor every day to monitor their progress. 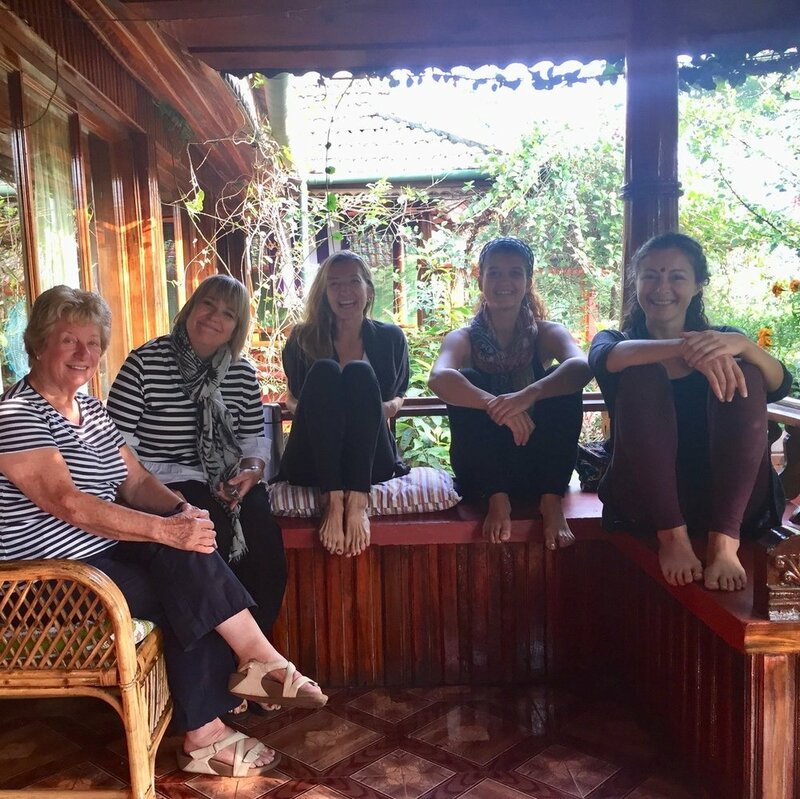 As far as panchakarma treatment results go, of the small group of individuals I was with, several reported impressive complete recoveries by the end of their stay from both acute and chronic conditions (including chronic pain caused by an autoimmune disease and serious lung conditions). Some improved but weren’t all the way back to perfect health. As for myself, I felt better, lighter, detoxified and happy, but they told me it would take another 42 days to notice the full results of the treatment. 42 days later, I still felt better than I did pre-treatment, but I wouldn’t describe my personal improvement as complete or miraculous. I was initially a little disappointed about that – I wanted the same perfect results I had heard about from others. A typical evening view on the short walk to dinner. Now that more time has gone by I see it from a wider perspective. It was a healing experience – that for me it wasn’t a perfect physical healing experience is okay. Just because it wasn’t the last piece of the puzzle doesn’t mean it wasn’t an essential piece. In conclusion, Udayagiri Retreat Center is a truly rare, unique and special place and I'm grateful for my time there. For me, the peace, the sincerity of the care, the lovingkindness of the staff and the beauty of the place alone were therapeutic. I went there focused on physical healing, but it also gave me healing for my spirit. And maybe that’s what I needed most of all, I just didn’t know it at the time. Above, left to right: the scenic drive from Calicut; bovine encounter on the walk to the village; the surrounding jungle; Kishor drumming; dosa lessons from Barathi; the peaceful woman who braided flower necklaces every day, exuding pure contentment; a relaxed social balcony moment; Midhun, the talented artist responsible for the yoga hall mural; a special Sunday pooja; brothers in the village; with Kishor and my favorite therapist Jisha; me happy after they sent me off with blessings and a flower garland.